see below for more details of this listing. 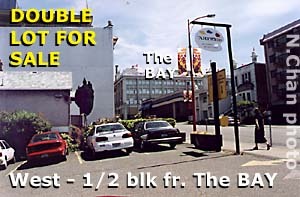 This choice property is zoned for mixed commercial/residential use. The double lot is currently occupied by a triplex (3 independent units: 2 with 3 bedrooms and 1 with 2 bedrooms) a large back yard, 5 parking spaces) and a wealth of shrubbery and trees. This garden oasis is located 1/2 block from "The Bay" department store, 3 blocks from City Hall and 1 block from Chinatown with its convenience of fresh produce, butcher shops, restaurants and multi-ethnic dining.